It is very easy to create, configure and play a Battle Royale on Toornament, thanks to our dedicated structures and match formats, and here's how! Pick the Battle Royale game of your choosing, and create a new tournament! If it's your first tournament, you may want to read our Starter Guide on how to create your first tournament. First thing to be done is to set the rules to be applied to your matches for your whole tournament, by going to "Settings" -> "Match". 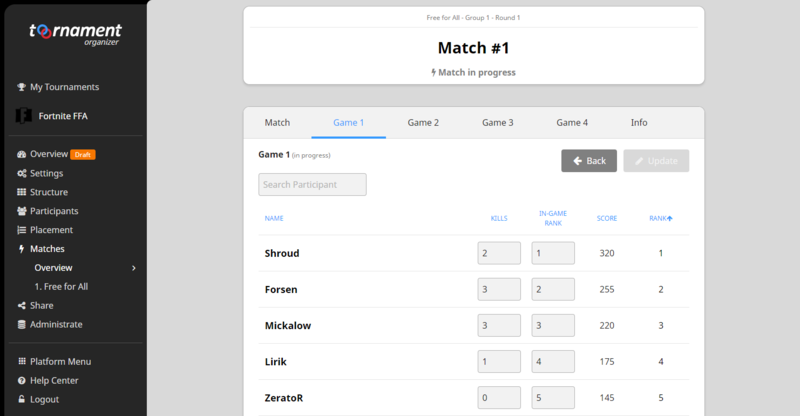 The Fixed Games (Advanced) format has been tailored for Battle Royale, and will be selected by default when you organize a tournament on a Battle Royale game. Moreover, a standard set of rules will be applied by default, but feel free to edit the values to the ones you are going to use for your tournament! We recommend only changing the values in the fields when you begin, and leaving the options enabled as is, to ensure you have the smoothest experience. This is the stage designed for the Free-for-all game modes, that can accommodate up to the 100 players per match PUBG usually has. Head to the Structure menu to access the creation interface. After selecting a Simple stage, name it, set how many participants will take part in it, and how many matches will they be divided into (it works a bit like Groups or Divisions, splitting the participants into several different matches). Given the size of matches in Battle Royale games, we recommend you open your Registrations, and have your participants register to the tournament. Don't forget setting Custom Fields up if you need them to provide you with detailed information. Next logic step, unless you prefer keeping your tournament private, is publishing it, so that potential participants can find it, and apply for registration. Publishing your tournament will make it visible to everyone both on the website and the mobile app, doubling the chances that people will stumble upon it and register! We also have a whole Share category on this Knowledge Base with guides, tips and advices on how to promote your tournament, but the idea is to make sure a maximum of people hear about it (unless, of course, you decided to keep it private!). Once your participants have registered, you have to validate them, and may then place them into the match(es) you have created. There is no difference for the Simple stage, that works just like any other stage, and the whole placement process is explained here. As soon as the first game information are available (people start getting eliminated), you may start entering metrics into the game sheet (menu "Matches" -> "Name of your Simple stage") and saving them. Alternatively, you may also choose to wait for the very end of a match to enter it all at once, that's entirely up to you. The system will automatically calculate the rank of players based on the points they earn by reaching a position and doing kills in the game, and report it to the whole match by adding the scores from all games in a match. That's it, you have your Battle Royale tournament on the right track, keep reporting your in-game ranks and kills, and Toornament handles the rest, ranking participants in each game and match! If you wish to create a whole competition, with players moving forward like in a bracket, just create more Simple stages, and use the Placement and Naming to set up your competition as you wish! For more advanced organizers, or professional ones, we have a free and open API that can help you improve your video and/or stream production with statistics overlays, results and the likes of it. It can also be used to develop tools to ease your life with tournament's management! Another great application would be the creation of stats infographics, like this one for the Just Dance World Cup.